Hummer H2 2003-2004, Full Interior Kit, With Door Panels (W/o Logo), W/o Heated Seats, 57 Pcs. Hummer H2 2003-2004, Full Interior Kit, With Door Panels (With Logo), W/o Heated Seats, 57 Pcs. Hummer H2 2003-2004, Full Interior Kit, With Door Panels (W/o Logo), With Heated Seats, 58 Pcs. Hummer H2 2003-2004, Full Interior Kit, With Door Panels (With Logo), With Heated Seats, 58 Pcs. Hummer H2 2008-2009, Full Interior Kit, 53 Pcs. Hummer H2 2005, 2006, 2007, Full Interior Kit, With Door Panels (W/o Logo), W/o Heated Seats, 53 Pcs. Hummer H2 2005, 2006, 2007, Full Interior Kit, With Door Panels (With Logo), W/o Heated Seats, 53 Pcs. Hummer H2 2005, 2006, 2007, Full Interior Kit, With Door Panels (W/o Logo), With Heated Seats, 54 Pcs. Hummer H2 2005, 2006, 2007, Full Interior Kit, With Door Panels (With Logo), With Heated Seats, 54 Pcs. Hummer H2 2003-2004, Full Interior Kit, W/o Door Panels, 56 Pcs. Hummer H2 2005, 2006, 2007, Full Interior Kit, W/o Door Panels, 52 Pcs. Hummer H2 2003, 2004, 2005, 2006, 2007, Exterior Kit, 43 Pcs. Hummer H2 2008-2009, Basic Interior Kit, 30 Pcs. Hummer H2 2003, 2004, 2005, 2006, 2007, Basic Interior Kit, 45 Pcs. Hummer H2 2003, 2004, 2005, 2006, 2007, Optional Overhead Console Interior Kit, W/o Sunroof, 4 Pcs. Hummer H2 2008-2009, Exterior Kit, 16 Pcs. Hummer H2 2003, 2004, 2005, 2006, 2007, Exterior Kit, Optional Rear Kit, 9 Pcs. 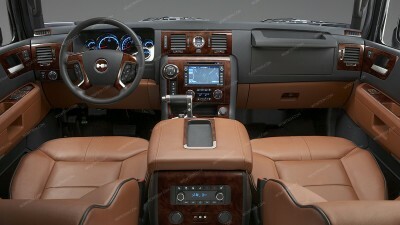 Hummer H2 2008-2009, Interior Dash Kit, Optional Front Overhead Console And Rear Overhead Air Vents, 10 Pcs. Hummer H2 2003, 2004, 2005, 2006, 2007, Exterior Kit, Optional Roof Rack "Hummer" Lettering, 24 Pcs. Hummer H2 2008-2009, Optional Rear Overhead DVD Console Interior Kit, 6 Pcs. Hummer H2 2003, 2004, 2005, 2006, 2007, Optional Overhead Console Interior Kit, With Sunroof, 1 Pcs. Hummer H2 2003, 2004, 2005, 2006, 2007, Interior Dash Kit, Optional Logo Inserts, 36 Pcs.